Year One are now following a more formal type of day, which includes: phonics, guided reading, daily English and Mathematics lessons and topic based learning on the afternoons. In Year One we will be learning all about 'The First Flight', we will be looking into The Wright Brothers and understanding how they changed the world. During our English lessons we will be learning all about Traditional Tales. We will be learning an alternative traditional tales called: The Three Little Wolves and The Big Bad Pig. Children will embed the story through T4W, and complete a range of writing topics using the story as a stimulus. Throughout English children will be developing SPAG skills. This term children will be learning to develop skills to support: subtraction. Children will then move onto using addition and subtraction skills, with a money concept. Children will learn about coins and notes, value of coins and notes and solve money based problems. During the Autumn term Year One follow an EYFS approach. Children have many opportunities to learn through play and during these sessions we will work in small focus groups with your child, working on: reading, writing and mathematics. The sessions will be purposeful, active and importantly FUN! Here at Brickhouse we feel that the transition between EYFS and KS1 is hugely important to get right! We have seen over the years how settled and more confident children are in their learning when they can ease into the KS1 approach slowly. During the autumn term we will be looking at books written by 'Julia Donaldson'. We will use T4W to retell her well-known stories; 'The Gruffalo and The Gruffalo’s Child'. If there is anything else you want to know about the Autumn term please check out our 'What's Coming Up' leaflet towards the bottom of the page! This website is a great way to support your child's learning through a different platform. You can support your child with their Reading, Writing, Spelling, Mathematics and Science skills using this site! Please find the link further down the page. Year One will complete a Phonics Screening Test (June 2019) which will assess their ability to read words using their phonic knowledge. For Phonics practice children are encouraged to use PhonicsPlay (please find the link further down the page). Using this tool not only echoes what we do in class but there are some great games to play quickly with your child, which can make it a great opportunity for learning and time together! This site allows children to read books online suited to their book bank colour they bring home. Bug Club makes reading outside of the classroom virtual, accessible and fun (please find the link further down the page). Please make sure that home reading books are returned to school as regularly as possible. Your child's book will not be changed unless the reading record has been commented and signed by an adult. Inside your child's reading log book, you will find hints and tips to support your child's reading at home, if you would like anymore advice on your child's reading and ways to support their reading, please do not hesitate to ask. Year One will have P.E. on Wednesday and Friday afternoons. Please make sure that your child has a labelled kit in school on these days as your child's physical education is very important. Please make sure you remove your child's earrings before these sessions. Can you please make sure your child is wearing school uniform at all times and can all items of clothing be clearly labelled with names. Spellings will go out every Friday, with the spelling test taking place the following Friday. Please practise these with your child as spelling is a vital part of your child's writing development. Spellings sent out are taken from the National Curriculum. What's Coming Up over the Year! Bug Club Log in, pick a book of your choice and complete the question bugs! EducationCity Log in, play and learn through a range of fun games and challenges! Phonics Play Lots of phonics games to develop decoding and blending skills. Watch this to help you understand how the Phonics Screening is delivered and what children are expected to do. Year One helped SandwichBOT to make a Jam Sandwich. 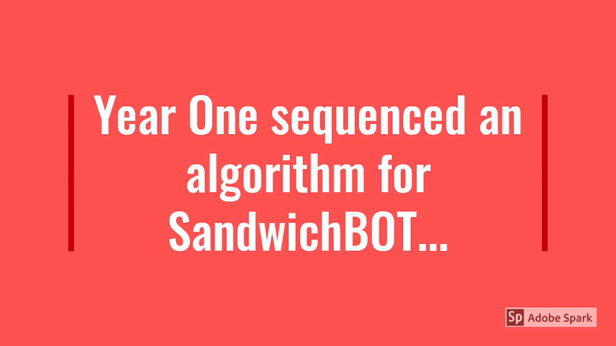 Children had to sequence instructions so that SandwichBOT could follow the algorithm correctly and make a Jam Sandwich. Miss Bal then recorded children's voices to add audio to their sequence/algorithm.